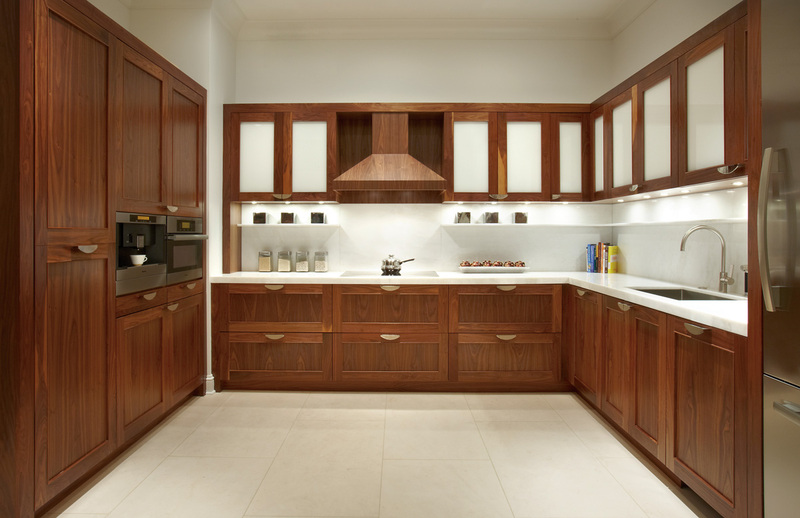 The problem is, walking into a cabinetry showroom can be quite overwhelming at first. Turns out that having literally endless choices in color and stain can be a problem. When you have so many options … how can you ultimately choose? Therefore, to assist you in narrowing down your options a tad, we’ve browsed the paint chips, perused the stain options, and polled the interior designers so you don’t have to. And we’ve come up with the six most popular kitchen cabinet colors (and finishes) for you to consider. Think clean and crisp. Think new laundry drying on the line on a summer’s day. Think freshly laundered towels or fields of cotton. White is the color of new beginnings and purity. And if that’s what your kitchen is in need of right now, this may be the color for you. 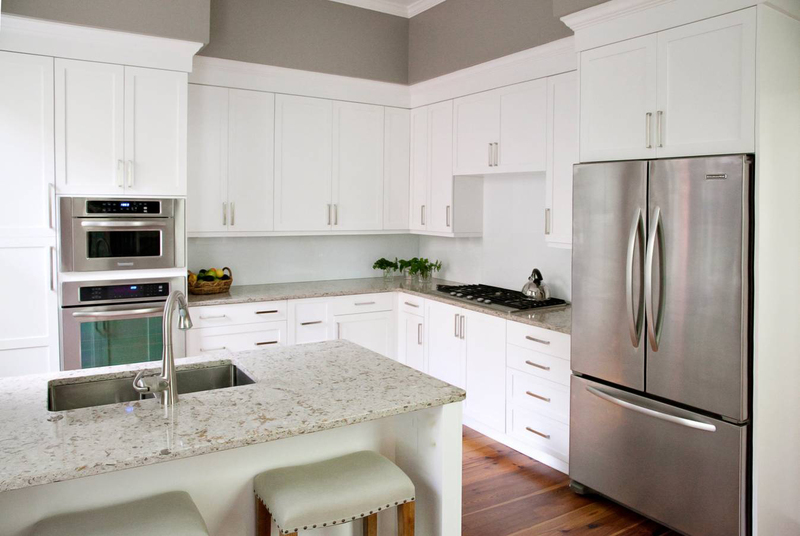 For several decades, in fact, white has been the leading cabinet color in kitchen cabinet trends. As the most popular shade for cabinetry then, it’s a good option for many styles of kitchens. It certainly fits well with a simple, straightforward design choice that won’t go out of style. It also allows you endless possibilities where other design choices are concerned. Go wild with countertops, get crazy with wall color, or invest in a daring floor covering — the sky’s the limit. On the other hand, the timeless nature of white indeed lends itself well to a simple, clean-cut kitchen with classic design features. Think white cabinetry paired with stainless appliances, quartz countertops, and a subtle black and white tile floor. Drawbacks of white cabinets include its proclivity to show blemishes. This includes hand grease and grime that may appear around knobs and door edges. Accentuated nicks and dings can be an issue too. All of this can be easily combated, however, by simply giving your cabinets daily wipe downs and washing them more thoroughly every month or so. Find cabinet cleaning tips here. Grey is the ultimate color for homeowners who want something different … but not that different. Its neutrality allows for a kitchen that is bold and modern, while remaining clean and versatile. Feel free to marry your grey kitchen cabinets with any number of bolder colors in wall, tile, or floor colors. Or alternatively, keep things laid back and completely neutral by pairing grey cabinets with wood or ceramic flooring, neutral granite countertops, and white or beige walls. As with any kitchen cabinet color, remember that the style of your cabinets will often dictate the precise shade of grey you choose. For example, our Maple Stone grey is light and airy and pairs perfect with our classic Shaker door style. But for a more retro door — for example, our Contempo door style — you might go for a deeper grey like our Maple Graystone. And finally, the last true neutral on our list — black. 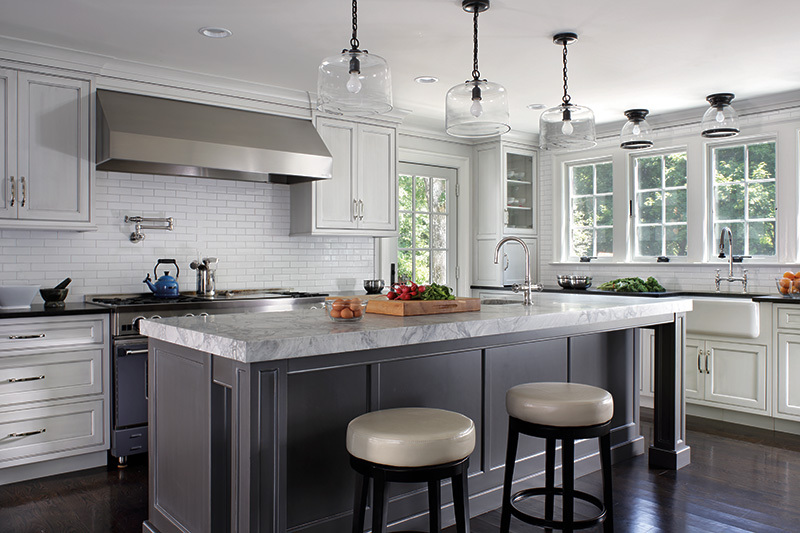 Perfect for kitchens that have an abundance of natural light, black is also an excellent hue for an ultra-modern look. Again, you’ll want a larger kitchen for black cabinetry to work really well. Pairing black kitchen cabinets with white countertops, white flooring, and white walls offers a super sophisticated look that’s going to last and stay fashionable. As is the case when you use black anywhere in the house, you’ll obtain a sleek and urban look that becomes even more to-die-for if you can get it close to brick. Deep black cabinets are also perfect for those who cook a lot and may or may not … be a little messy (spills hardly show, thank goodness). Remember also that on most black cabinetry, you’ll want a super smooth finish (it maximizes the sleek effect), so look for cabinet door styles that aren’t too detailed. Finally, we have classic navy blue. Think French sailors, school uniforms, and … blueberries in August. While navy blue may not be quite so “neutral” as white, grey, and black, by many measures, it’s still technically considered a neutral. This matters because it means you can still pair navy with bright focal colors, and it likely won’t clash. Our Triton Blue is especially perfect for this kind of matching. It’s just cool enough to be considered a member of the blue family, but it also casts a shade of grey that keeps any intensity under wraps. If Triton is just a tad too deep and dark for your liking, however, essentially all of our cool colored blues have been flying off the shelves. For more options, consider our Maple Carbon, which is slightly lighter than Triton Blue but still straddles that beautiful space between blue and grey. By far, the most popular wood species and natural stain color is walnut. You can see it here in our gallery. Walnut is actually quite close to our hearts at Plain & Fancy. A favorite of our founder, John Achey, this wood species offers a truly unique color and graining. In fact, much of the graining is a huge challenge to source as grading the final cuts means locating the perfect variance between the center heartwood and the sapwood, which makes up 25 to 30% of each tree trunk. In the end, true lovers of walnut and wood in general will appreciate the wide variety of shades and colors that this species can provide. And with a natural finish, these varied shades are exceptionally well highlighted, creating works of art that also function as durable, long-lasting cabinetry. Our second most popular wood and stain combination is rift cut white oak in the finish Narvik. See it here. Whereas walnut tends to be a bit deeper in color and saturation, white oak is lighter and fresher-looking in many ways. Furthermore, rift sawn white oak offers a truly unique effect. Rift sawn wood is cut in a specific way so that the annual rings are generally at around 45 degrees (or roughly between 30 and 60 degrees). This creates some waste when cutting the wood, but it’s ideal for a truly dimensionally stable effect (super durable) and a unique appearance that you simply won’t see anywhere else. Most rift sawn techniques are done with oak. And remember that if Narvik isn’t your stain of choice, we also have other stain options that pair with rift cut white oak perfectly. At Plain & Fancy, we’ve been a family owned and operated business for over 50 years. Our dedication and commitment to excellence in customer care is matched only by our skill and expertise in cabinet design and installation. Allow us to service your unique cabinetry needs with state-of-the-art, custom designed and hand-cut cabinetry that’s built to last. To peruse our cabinet door styles, custom colors and finishes, and more, we invite you to visit our Design Center in Schaefferstown, or locate a showroom close to you.